Several weeks ago I received an interesting email from a Danish engineer in regard to my story about the Aon/Amoco/Standard Oil building (Big Stan) in Chicago. He was concerned that I had given a jaundiced picture of marble as a cladding material. “You forgot to write that there are a very, very high number of marble facades performing extremely well in all kinds of climatic zones,” he wrote. He is absolutely correct that the vast majority of buildings clad in marble do not experience the panel bowing problems found on Big Stan. Marble is generally a sound choice, when used correctly. But in the article co-written by my Danish correspondent, it is also clear that there have been what seems to me an unusually high number of buildings where marble cladding has failed. (Durability of Marble Cladding—A Comprehensive Literature Review, in Journal of ASTM International, v. 4 no. 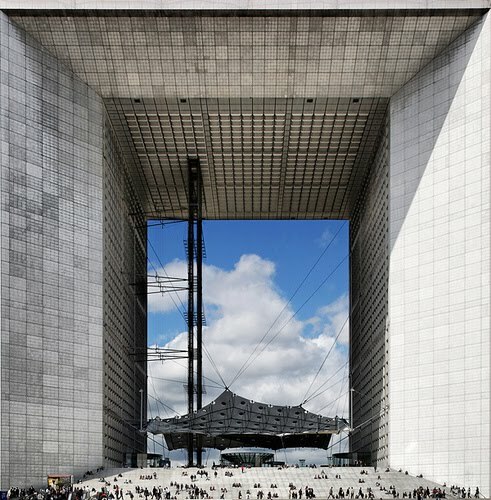 4, 2007) These include La Grande Arch de la Defénce (see photo below) and SCOR Tower, Paris; Richmond City Hall, Virginia (all marbles panels removed and replaced by steel, painted aluminum, and granite); and IBM Tower in Brussels. 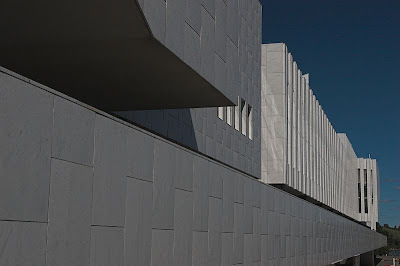 The other is Helsinki’s Finlandia Hall, designed by the great architect Alvar Aalto. 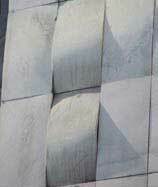 Completed in 1972 with 7,000 square meters of Carrara marble, the panels started to deteriorate with bowing, cracking, and spalling. The fine citizens of Helsinki decided to replace the panels and chose to reuse Carrara again. Within six months these new, supposedly ultrastrong, ultrasecure panels began to warp. Curiously, they warped convexly; the original panels warped concavely. To this day no can explain why. 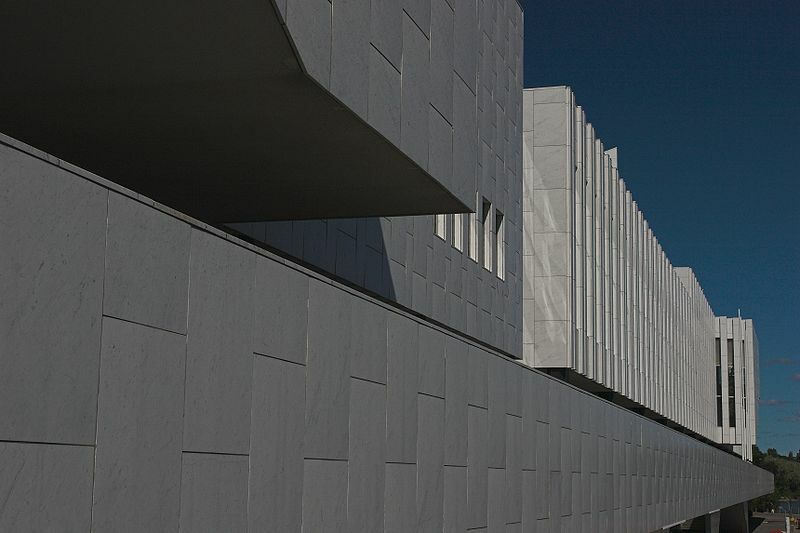 Building stone has failed across climates from northern Europe to Cuba to Libya to Canada in marble quarried in areas equally as diverse, such as Vermont, Greece, Greenland, and Norway. Carrara marble, however, leads the field, in part because it is the most widely used marble in the world. The higher the temperature variations, the higher degree of bowing. Higher humidity can lead to problems when water penetrates pore spaces. There is no correlation between panel size and thickness and tendency to bow. Bowing tends to be more pronounced on the southeast and southwest facades. More pronounced bowing occurs on the upper parts of buildings. No link has been found between anchoring system and bowing. Marble color doesn’t impact bowing. At least a half-dozen previous authors have noted that bowing depends on the grain boundaries of the marble, which ultimately depends on the geologic history of the stone. The authors recommend the development of a series of guidelines to choose, test, and produce marble panels. They conclude that “technically acceptable properties should…have very high priority when choosing a marble type for a building project, whereas today aesthetical properties are often considered as being of greatest importance even though the aesthetic problems will change rapidly for a nonsuitable marble as it deteriorates.” In other words, no matter how pretty and elegant the Carrra marble looked on Big Stan, when they failed, it was a monumental screw up that could have been avoided if the builders had been more concerned with function over style. Once again, it pays to pay attention to geology.